Abcam’s 2-Phosphoglycerate Assay kit (ab174097) is a sensitive, fast and easy-to-use kit. In this assay, 2PG(2-phosphoglycerate) is converted by Enzyme Mix to PEP (phosphoenolpyruvate), which is further converted to pyruvate. The pyruvate is oxidized to generate color (OD 570 nm) and fluorescence (Ex/Em = 535/587 nm). The colored product or fluorescence intensity is proportional to 2PG level. This assay kit can detect 2PG level below 20 pmol and can be used for a variety of sample types. Visit our FAQs page for tips and troubleshooting. 2-phosphoglycerate (2PG) is an important intermediate in the glycolysis pathway. 2PG is converted by enolase to phosphoenolpyruvate (PEP) which is a key step from glucose to pyruvate. Aberrant glycolytic metabolism is a highly studied and potentially critical mechanism for ATP generation in cancer cells (The Warburg effect). Measurement of intracellular 2PG levels is a useful tool for analyzing the glycolytic pathway and its relevance to cancer research. 2-phosphoglycerate (2PG) is an important intermediate in the glycolysis pathway. 2-Phosphoglycerate is converted by enolase to phosphoenolpyruvate (PEP) which is a key step from glucose to pyruvate. Aberrant glycolytic metabolism is a highly studied and potentially critical mechanism for ATP generation in cancer cells (The Warburg effect). Example of 2PG Standard curve obtained with 2-PG Assay Kit (ab174097) by colorimetric reading. Please not this data is example data only. Example of 2PG Standard curve obtained with 2-PG Assay Kit (ab174097) by fluorometric reading. Please not this data is example data only. 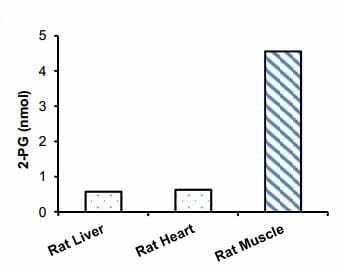 Measurement of 2PG level in rat liver, heart and muscle lysate (200 µg protein each). Assays were performed according to kit protocol. This is example data only. ab174097 has not yet been referenced specifically in any publications. Publishing research using ab174097? Please let us know so that we can cite the reference in this datasheet. There are currently no Customer reviews or Questions for ab174097.